So I got kicked out of the study for not actually being depressed. Oh man, and American psychology is so weird! He said something like: “Don’t worry, it doesn’t mean you’re not depressed. Just not depressed enough for this study.” Ha ha, oh man! Even though I was not able to participate in the study and would receive no moneys, I went home and felt happy all day about not being depressed. It felt like a small victory. Definitely one of the stranger ways I’ve tried to make money! 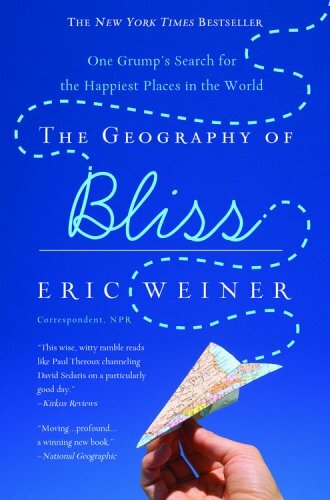 While at my appointment, I was actually reading The Geography of Bliss by Eric Weiner. It’s one of the most interesting travel books I’ve ever read and has made me think a lot about happiness and where and how to find it. Eric Weiner, a correspondent for NPR, decided to travel to ten different countries to explore the idea of what makes a country or a culture happy or unhappy. He decided on some of the countries by looking at the World Database of Happiness. It’s based in the Netherlands and is a place where research is conducted about which countries are the happiest. I really appreciated this statement about the Bhutanese excess of sincerity, especially in relation to my experience with the study about depression. It made me realize that I value sincerity, and I felt glad about not having the ability to lie or be insincere about something (even if that something was depression and would have made me a little bit of money, ha ha). It made me think about how our values and how well we live them are something that can contribute to our happiness. The book also brought up the question about whether happiness really is the highest goal or whether leading a meaningful life is more important. It was pointed out that a meaningful life is not always a happy one. Weiner says: “Yes, we want to be happy but for the right reasons, and, ultimately, most of us would choose a rich and meaningful life over an empty, happy one, if such a thing is even possible.” However, I think that engaging oneself in something meaningful does bring a kind of happiness. Also for myself I’ve noticed that the times I’ve chosen to be happy in life and work at happiness when it hasn’t been easy are also some of the times that my life has felt the most meaningful. At the end of the book, Weiner realizes that what he’s learned the most from his travels is that “happiness is one hundred percent relational” and that “our happiness is completely and utterly intertwined with other people: family and friends and neighbors and the woman you hardly notice who cleans your office. Happiness is not a noun or verb. It’s a conjunction. Connective tissue.” I love that idea, happiness as connection and the relationships in our lives.